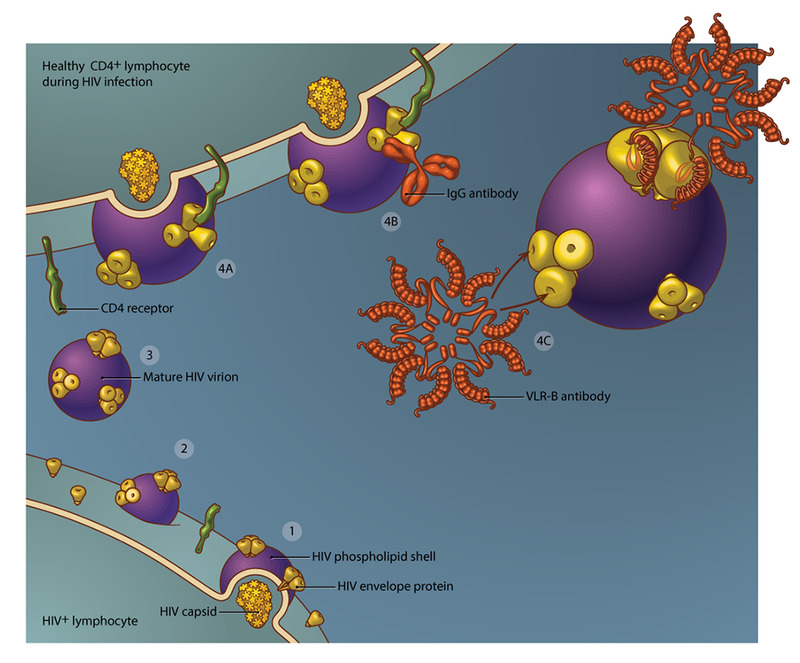 To infect new host cells, HIV buds off of infected cells, acquiring a coat of human phospholipids (shown in purple) that shields the HIV capsid (shown in yellow). Trimeric HIV envelope proteins (shown in yellow) pierce through the phospholipid shell to bind CD4 receptors (shown in green) on neighbouring lymphocytes. These represent the only HIV-specific surface antigen on the mature virion. Once released into serum, the mature virion is labile and has limited time to bind a new host cell before it becomes inactive. Without intervention, the HIV envelope proteins engage CD4 receptors, initiating membrane fusion and transfer of the HIV capsid. Conventional IgG antibodies are rarely able to disrupt this process, and are therefore unable to block the spread of HIV to new cells. By contrast, sea lamprey-derived VLR-B antibodies have a flexible loop structure in their antigen binding region, enabling access to novel binding sites in grooves or clefts in the envelope protein that are more vulnerable to neutralization. Studying these interactions may lead to the discovery of new neutralizing epitopes. I rendered the final piece completely in Illustrator (a vector format that can be enlarged to any size) using a cell shading approach.